If you received a book over the holidays, was it digital or printed on paper? E-books (and devices on which to read them) are multiplying like rabbits, as are the numbers of eReading devotees. It’s easy to assume, particularly in the United States, with the highest level of e-book sales worldwide, that the only way this trend can go is up. Yes, there was triple-digit e-book growth in 2009, 2010, and 2011, though by 2014 those figures had settled down into the single digits. What’s more, when you query people about their reading habits, you find that wholesale replacement of paper with pixels will be no slam-dunk. Over the past few years, my colleagues and I have been surveying university students in a variety of countries about their experiences when reading in both formats. Coupling these findings with other published data, a nuanced picture begins to emerge of what we like and dislike about hard copy versus digital media. Here are five facts, fictions, and places where the jury is still out when it comes to reading on-screen or on paper. Cost is a major factor in choosing between print or the digital version of a book. The “container” for written words is irrelevant. Due attention to the inside of books, and due contempt for the outside is the proper relation between a man of sense and his books. When I began researching the reading habits of young adults, I assumed these mobile-phone-toting, Facebooking, tweeting millennials would be largely indifferent to the look and feel of traditional books. I was wrong. In response to the question of what students liked most about reading in hard copy, there was an outpouring of comments about the physical characteristics of printed books. Many spoke about the aesthetics of turning real pages. One said he enjoyed the feel of tooled Moroccan leather. They enthused about the smell of books. In fact, 10% of all Slovakian responses involved scent. E-books are better for the environment than print. Debate continues over whether going digital is the clear environmental choice. Yes, you can eliminate the resources involved in paper manufacturing and book transport. But producing – and recycling – digital devices, along with running massive servers, come with their own steep costs. The minerals needs for our electronic reading devices include rare metals such as columbite-tantalite, generally mined in African conflict-filled areas, where profits often support warlords. Recycling to extract those precious metals is mostly done in poor countries, where workers (often children) are exposed to enormous health risks from toxins. The serried ranks of servers that bring us data use incredible amounts of electricity, generate vast quantities of heat, and need both backup generators and cooling fans. I can’t bring myself to print out online material simply for environmental considerations. However, I highly, highly prefer things in hard copy. Users are satisfied with the quality of digital screens. Manufacturers of e-readers, tablets, and mobile phones continue to improve the quality of their screens. Compared with devices available even a few years ago, readability has improved markedly. However, for university students who often spend long hours reading, digital screens (at least the ones they have access to) remain a problem. When asked what they liked least about reading on-screen, there was an outpouring of complaints in my surveys about eyestrain and headaches. Depending upon the country, between one-third and almost two-thirds of the objections to reading on-screen involved vision issues. It’s harder to concentrate when reading on a screen than when reading on paper. True – by a landslide. My question was: On what reading platform (hard copy, computer, tablet, e-reader, or mobile phone) did young adults find it easiest to concentrate? “Hard copy” was the choice of 92% (or more) of the students in the four countries I surveyed. Not surprisingly, across the board, respondents were two-to-three times as likely to be multitasking while reading on a digital screen as when reading printed text. It goes without saying that multitasking is hardly a recipe for concentrating. How does concentration relate to reading? There are different ways in which we can read: scanning a text for a specific piece of information, skimming the pages to get the gist of what is said, or careful reading. The first two approaches don’t necessarily require strong concentration, and computer-based technologies are tailor-made for both. We search for specific keywords, often using the ‘Find’ function to cut to the chase. We jump from one webpage to the next, barely reading more than a few sentences. When we wander off from these tasks to post a status update on Facebook or check an airfare on Kayak, it’s not that hard to get back on track. What computer technology wasn’t designed for is deep reading: thoughtfully working through a text, pausing to reflect on what we’re read, going back to early passages, and perhaps writing notes in the margins about our own take on the material. Here is where print technology wins. At least for now, university students strongly agree. Headline image credit: Books. Urval av de böcker som har vunnit Nordiska rådets litteraturpris under de 50 år som priset funnits by Johannes Jansson/norden.org. CC-BY-2.5-dk via Wikimedia Commons. Naomi S. Baron is professor of linguistics and Executive Director of the Center for Teaching, Research, and Learning at American University in Washington, DC. 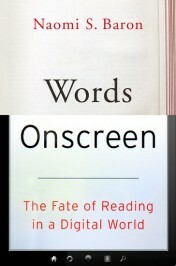 Professor Baron is also the author of Words Onscreen: The Fate of Reading in a Digital World and Always On: Language in an Online and Mobile World (OUP 2008). Out of interest was there any control for topic of reading? Or was it reading in general? I would expect different responses depending on the topic at hand. Print – textbooks, especially technical material with graphics and reference material, and you frequently need to flip to other locations (e.g. to a glossary). Also, children’s books, so that children have the experience of a physical book with illustrations. Finally, books with a sentimental value – ones that have a meaning for you deeper than just the words. E-readers. Anybody who does a lot of reading really should get an e-reader (like a Kobo or Kindle), with a black-and-white screen that simulates the experience of reading on paper. Much easier on the eyes. Light, not expensive and with a great battery life. Good for long reads like books and articles. Tablets. Good for browsing on the web or reading short bits. I find them problematic for longer texts, because the bright screen is hard on my (older) eyes. Desk or Laptop Computers. Good for doing research, when you want to scan websites and books quickly. Very hard for long reads, since you must be sitting in one position. Plus the bright screen is hard on your eyes. I used to print out documents and webpages so I could read them more comfortably on paper. I haven’t had to do this since I got an e-reader. As for buying e-books versus paper, I think dedicated readers will want to be able to access both. There are millions of books available instantly online (and those out of copyright are free). On the other hand, more used books than ever are on sale at good prices. Altogether, it is a Golden Age for readers. Arguments about saving trees always have seemed specious to me as long as their growth and harvesting is responsibly done. Trees grown for pulp are the ultimate renewable resource, and their managed development and utilization historically have provided jobs and contributed to to the economy. As the story points out there are questionable practices and materials involved in the manufacture of electronic devices and their safe disposal presents unique challenges. Humankind cannot live in the environment without being presented with difficult challenges, but the adoption of reasonable, rational, and sincere practices to minimize and control damages seems like the most realistic choice. Homo sapiens always leave footprints. It’s a matter of how many and how large. I read more on the computer because I’m used to it, I suppose. It’s also nice to buy e-books because I can obtain it instantaneously and don’t have to worry about shipping or going to the store. However, one of the reasons I hate buying e-books, despite this and the cheaper price and instantaneous retrieval is the way that electronic files become proprietary. I bought mp3 files on the Internet a while ago, which I could only have on four computers, all of which died before I could deauthorize the computers for the music. Or others, once the computer died, I could not re-download them, even though the store apparently knew that I had bought them. In e-books, we see this with the DRM copyright protection. I understand that it’s meant to be a matter of copyright protection, but the fact remains that I could very easily be unable to read a book I bought through no fault of my own. We also see it with the fact that if you have a certain e-book reader, you probably can’t have another e-reader on the same device. Certain publishers have it set-up so that you can only have your books on a certain amount of devices. If I have a bound book in my hands, unless I sell or lose it, it’s mine. I like paper books. However, they are expensive in my country. Since I started using kindle and other e-book libraries, I have read more books in this semester than in the whole last decade! Quite an interesting, enlightening, political, ecological, economical and readable piece of writing. I love it. As a college student myself, I prefer the hardcopy of books rather than the digital books. Having the digital book is nice because it is more cost effective and it requires less space to hold physically, but retaining the information takes twice as much than it would with a hardcopy. When digitizing the book, it takes away the experience of using a book but also takes away money from the author. Writing books is the main source of income for authors and when it is digitized, free copies can be established, which takes away money from the author. Having the book digitized also creates dependence; dependence on needing an electronic device to read, whereas the hardcopy wouldn’t require any dependence.